Slow Cooker Chicken Bacon Chowder. Warm and comforting and oh so flavorful. !! At the first hint of fall, I break out both of my slow cookers and get to work on all the delicious low carb slow cooker recipes. In fact, I use my crockpot year round. It is great in the winter when you just want to curl up on the couch and don’t feel like cooking and it is equally as great in the summer for transporting food to cookouts, low carb barbecues or any type of fun get together. BUT, it can be a lifesaver during the really hot months when you don’t want to heat up the stove and make you house even hotter. One of my favorite type of low carb recipes to make in the slow cooker is definitely low carb soups and stews. This low carb chowder being among the top favorite. 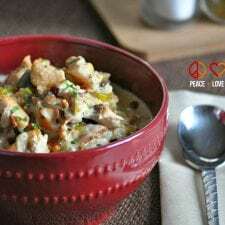 This low carb Slow Cooker Chicken Bacon Chowder is deliciously rich and flavorful. If you are looking to impress your friends with your cooking skills, this would be the dish to make them. Remove chicken from pan and set aside. De-glaze the pan with the remaining 1 cup of chicken stock. Using a rubber spatula, scrape up any bits of chicken that may be stuck to the pan. Add chicken stock to slow cooker. Add heavy cream, cream cheese, garlic powder, and thyme to the slow cooker. Stir until well combined and there are no longer any visible chunks of cream cheese. Once the chicken has cooled, cut it into cubes and add it to the slow cooker, along with bacon. Stir until all ingredients are well combined. Cover and let cook for 6-8 hours.